First, I would like to thank the fabulous Tobi Fairley for featuring me on her blog today! What a thrill. Tobi is a fabulous designer, business coach, mentor and a friend! If you have ever thought about taking one of her courses, don't think any more. Just Do It!! I really can't plug her enough. She has helped me in so many ways! 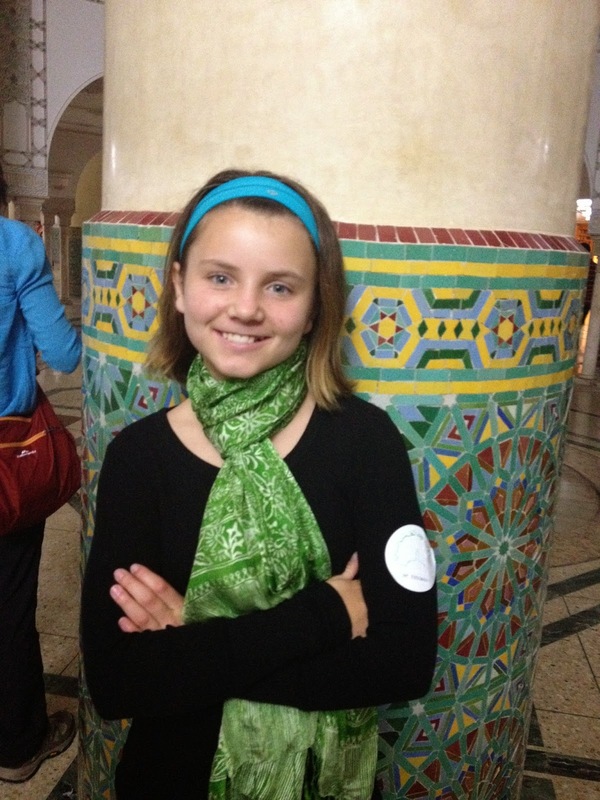 In Tobi's blog she mentions that I just got back from an inspiration/shopping trip-- TO MOROCCO!! It was as fabulous as I had always dreamed it would be. 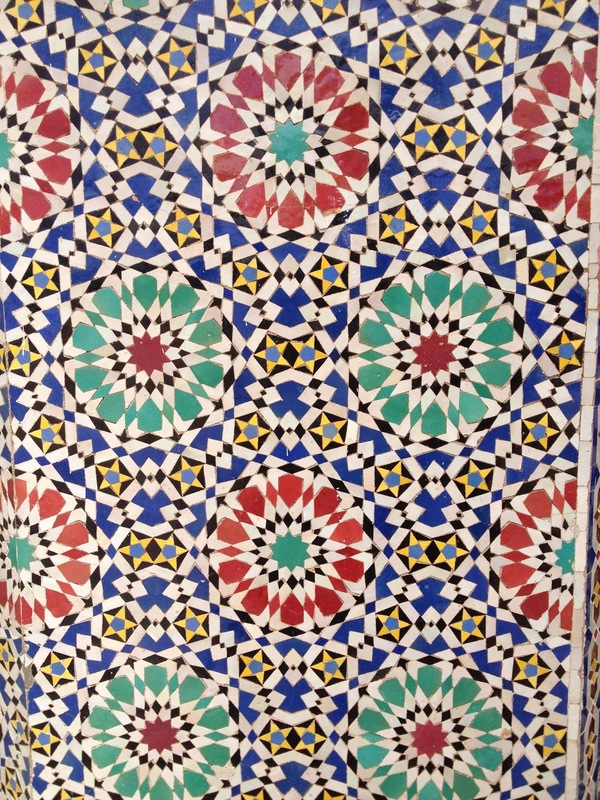 I would go back tomorrow:) Back to Tobi's blog...On the blog, two kitchens I designed feature Moroccan Tile! 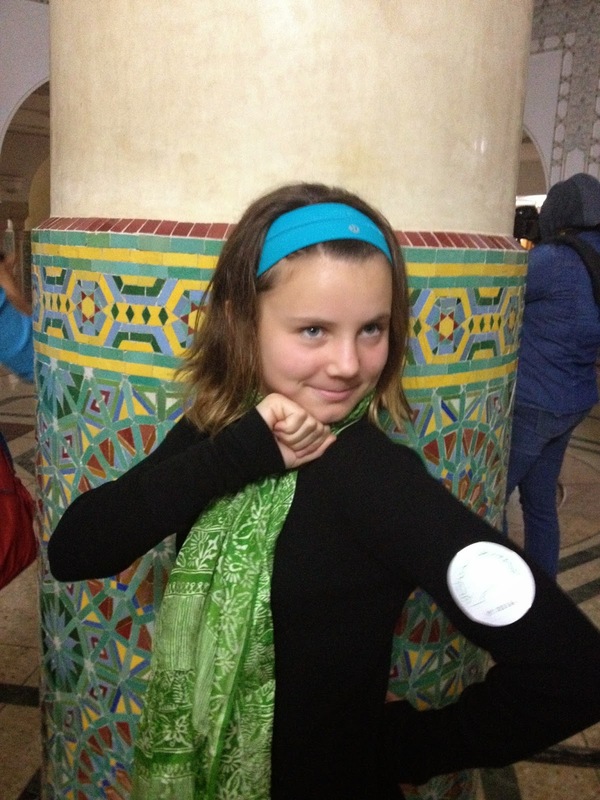 I love the Moroccan tile and the timing couldn't have been better on her post! 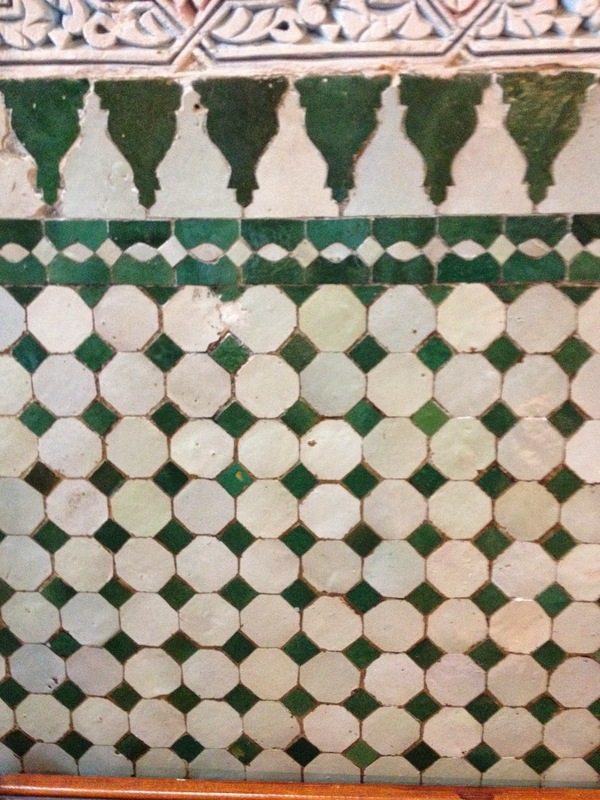 I love that each tile is hand made and that every color is a little different. When used in a kitchen or bathroom you get such a beautiful texture and a subtle shine. 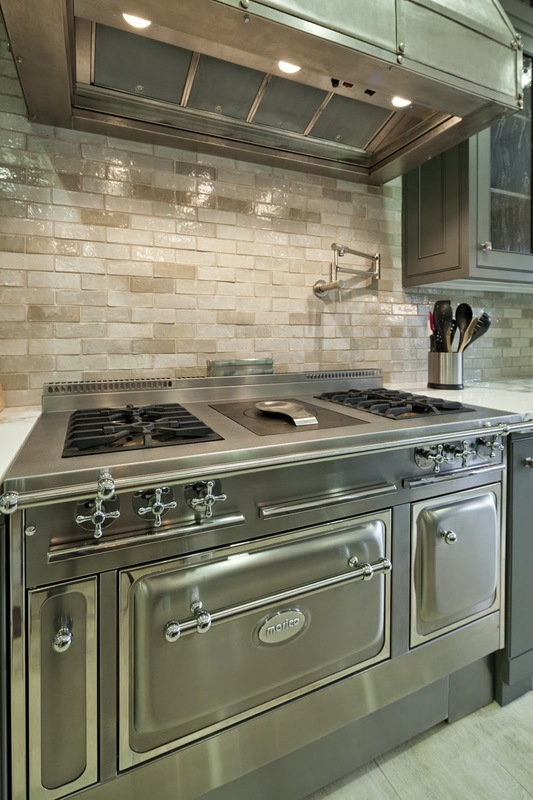 The colors in the tile I used below pull together the grays, the veining in the Arabescato Marble, the Zinc hood and stainless metal. 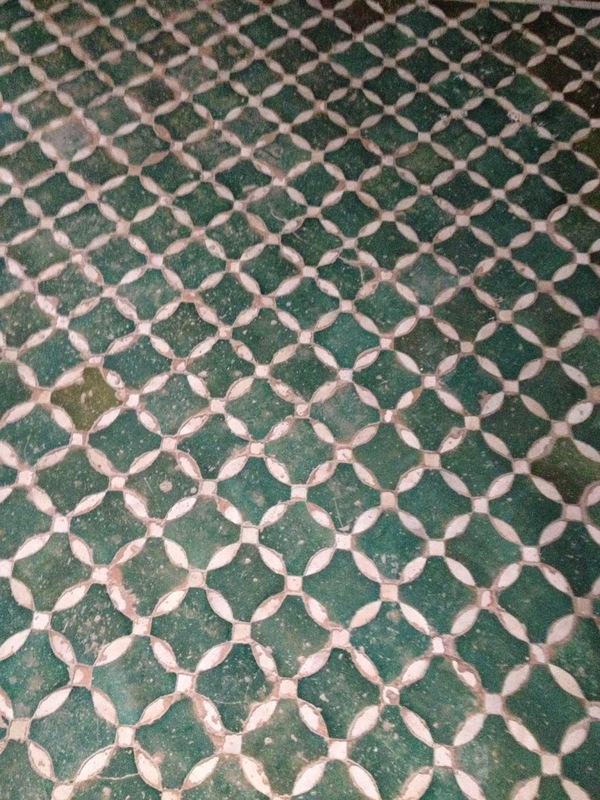 Here I used the tile to surround a pizza oven. 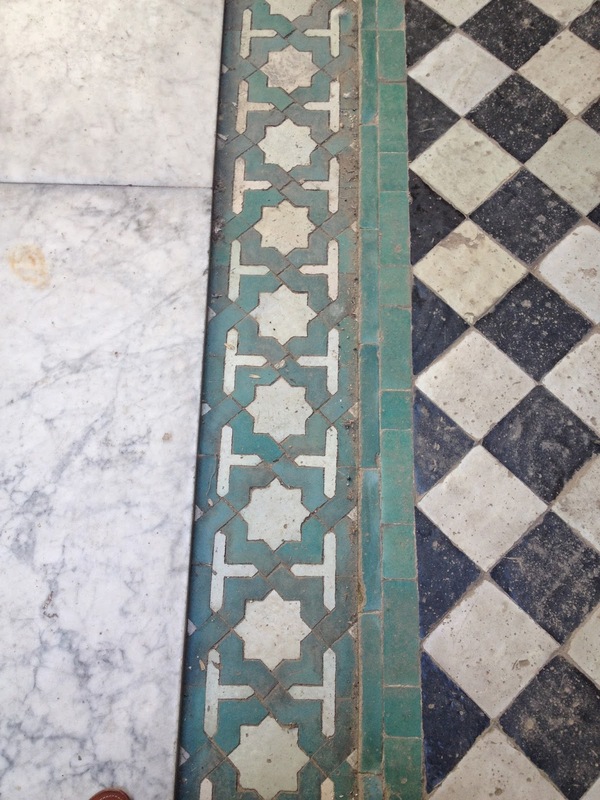 Again, it is a magical "combiner" tile that brings everything together. 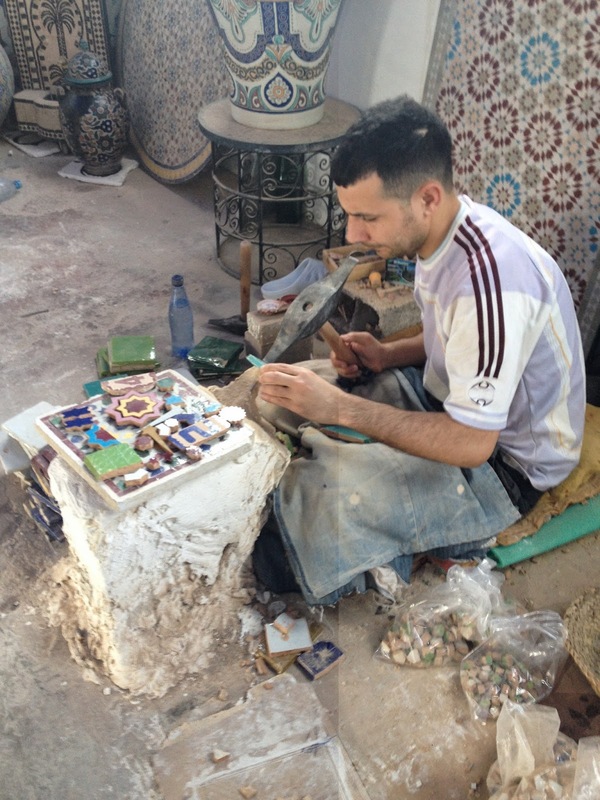 While in Morocco, I watched the artisans create the mosaics from the hand made tile. Talk about a labor of love! They sit their hours and hours tapping on the tiles. I would break one in a minute! 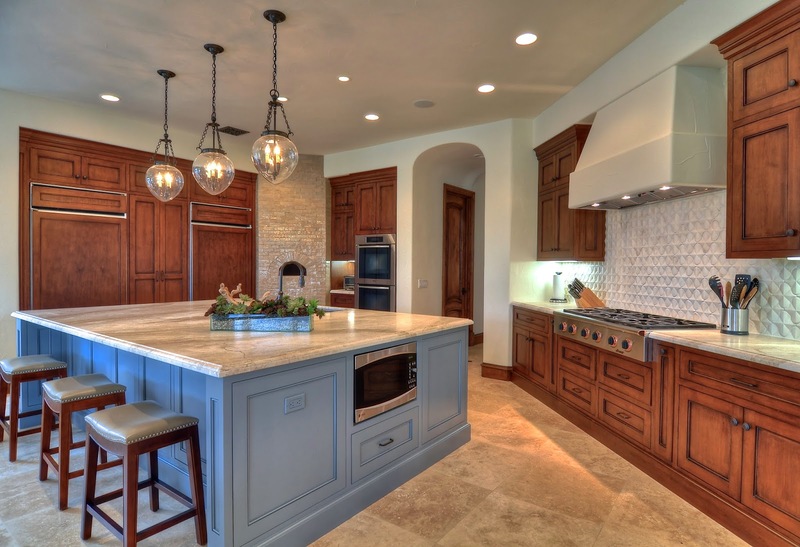 Above, I used a very calming ceramic tile in the kitchens, but there are many other types as you will see below. 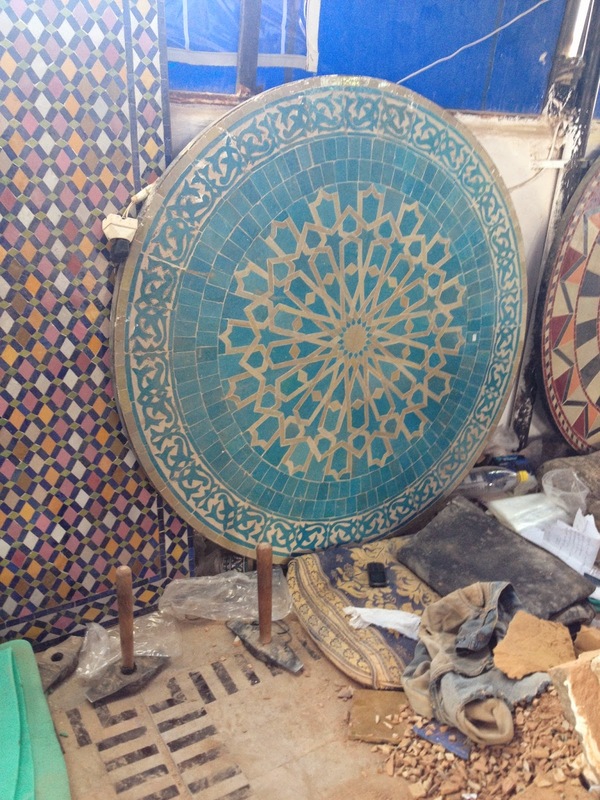 The artisan was making mosaics for a table. I LOVE the turquoise one, below!! 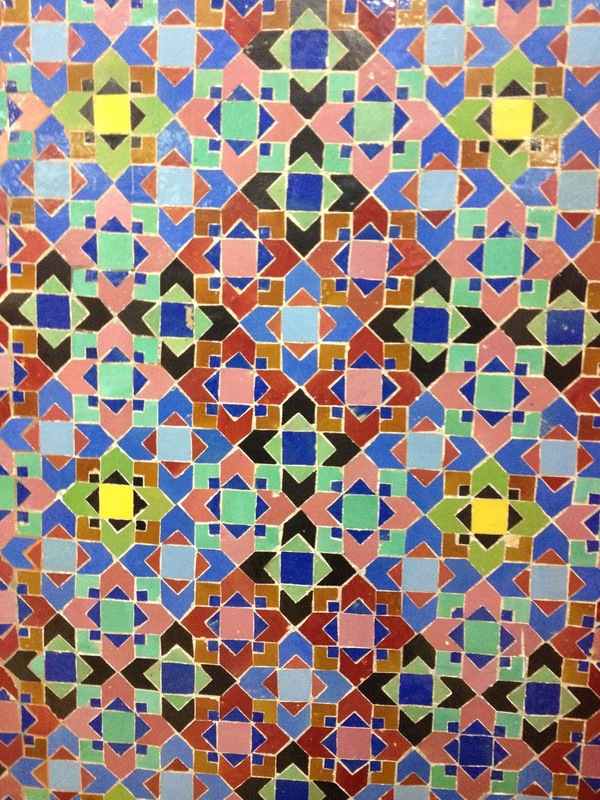 Below, are some unglazed ceramic tiles. The neutrals are just beautiful. 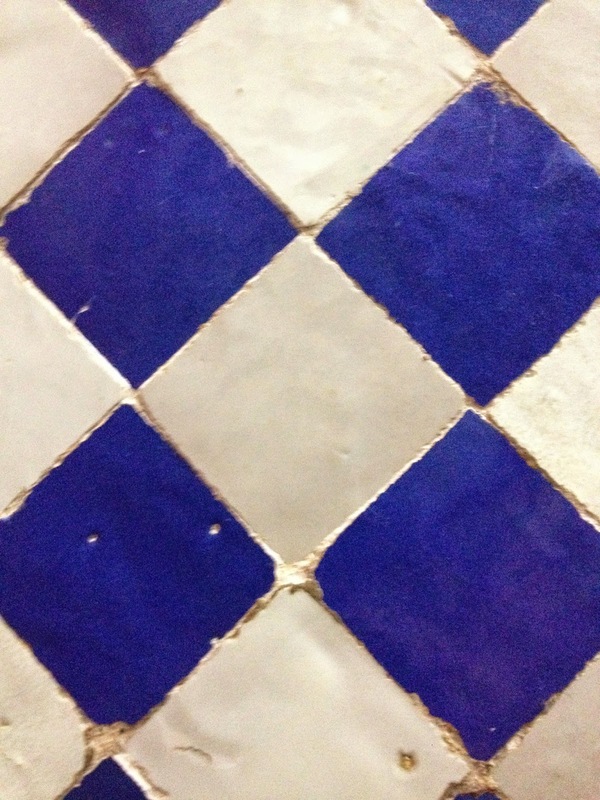 I think the subway on the top photo is an unglazed terra cotta tile. 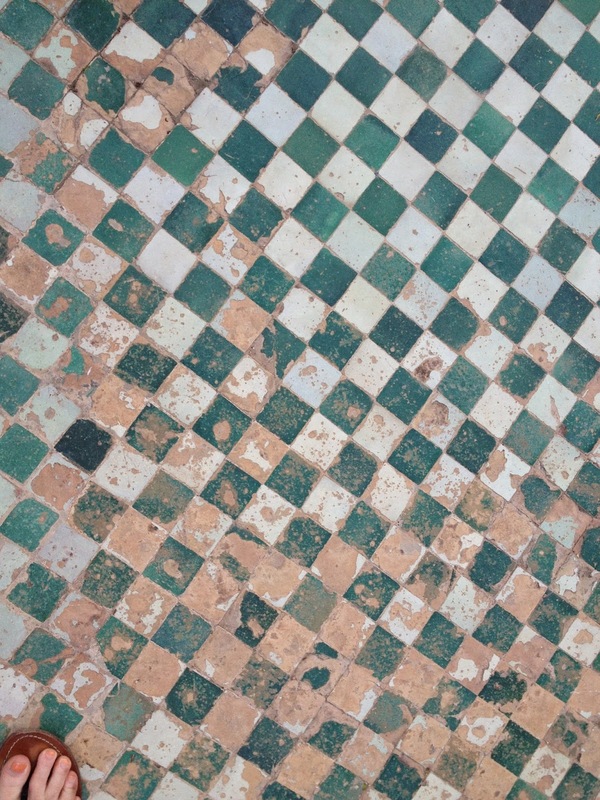 In Fez, Morocco, I saw a home they were refurbishing. 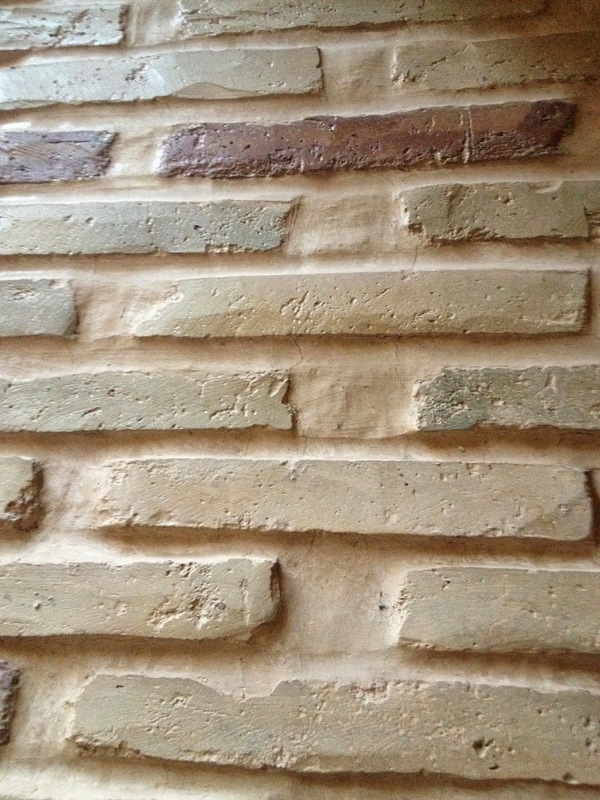 Below, were some handmade brick tiles. They actually use limestone dust to make the mortar. It looks so smooth! The mortar is built to last for centuries. I really want to use this in a new home that I am currently designing. Wouldn't it look gorgeous behind some floating wood shelves? 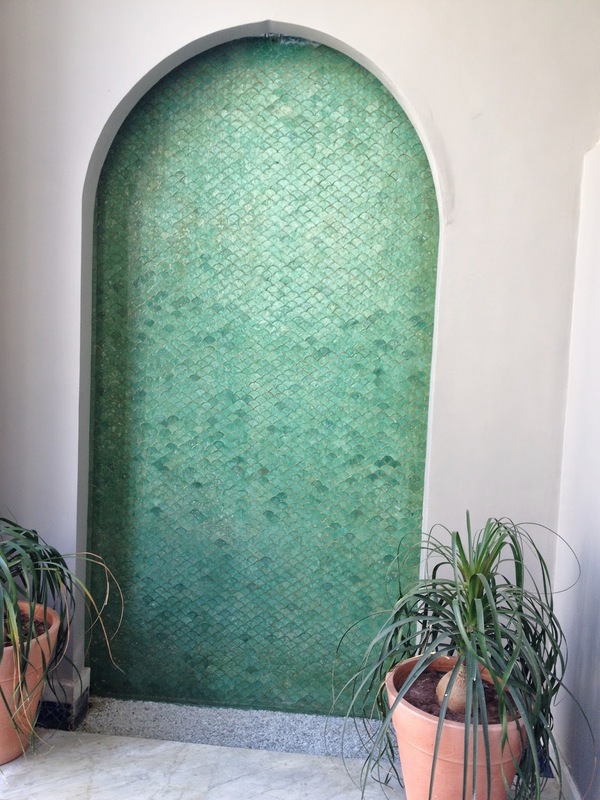 The ceramic, glazed tiles used in a single color look gorgeous. 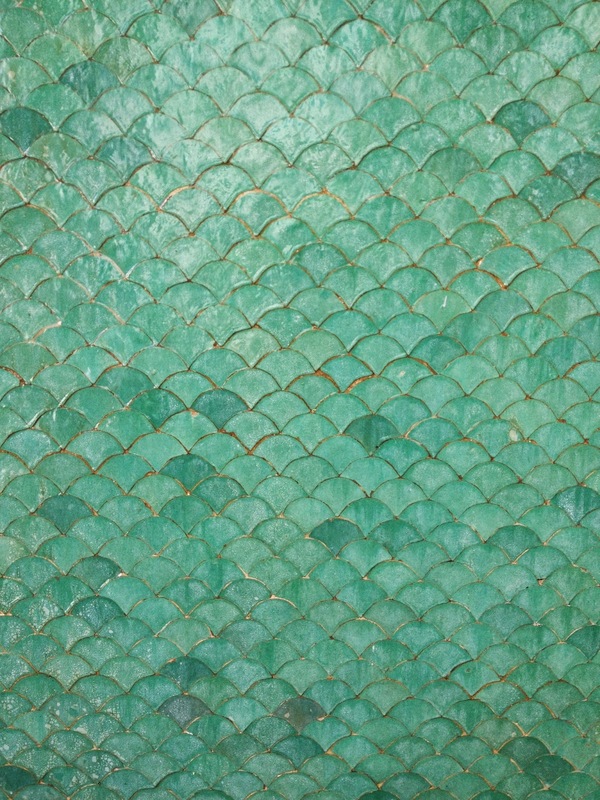 The pattern is a "fish scale" and it indeed shimmers. I don't know if you can tell, but this is a fountain. So pretty and effervescent! 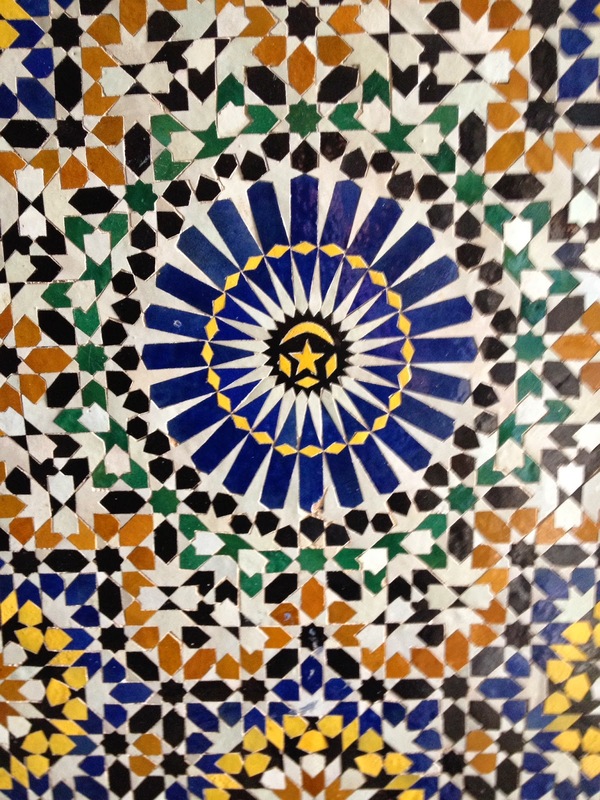 Here are a selection of simple ceramic patterns. The first was found in a courtyard and used on the floor. I have never seen this pinwheel shape. 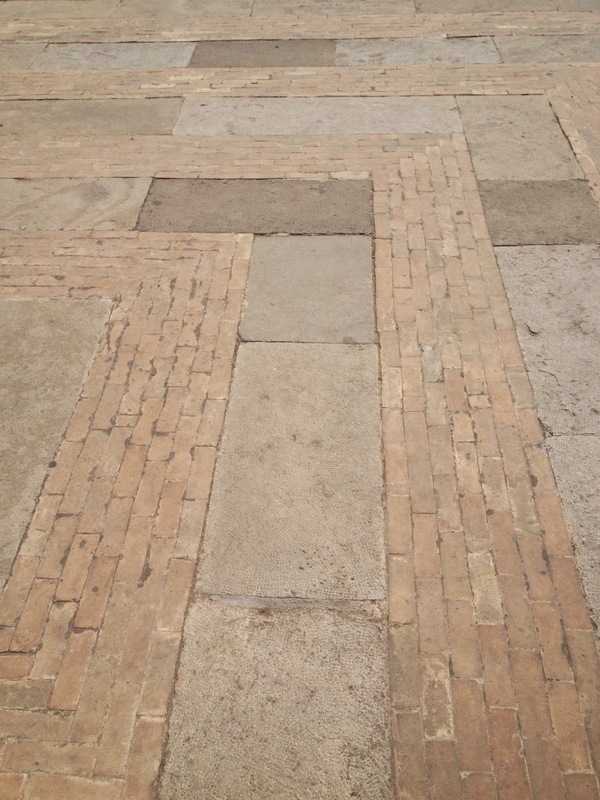 This floor is centuries old. I am obsessed with this zig zag! 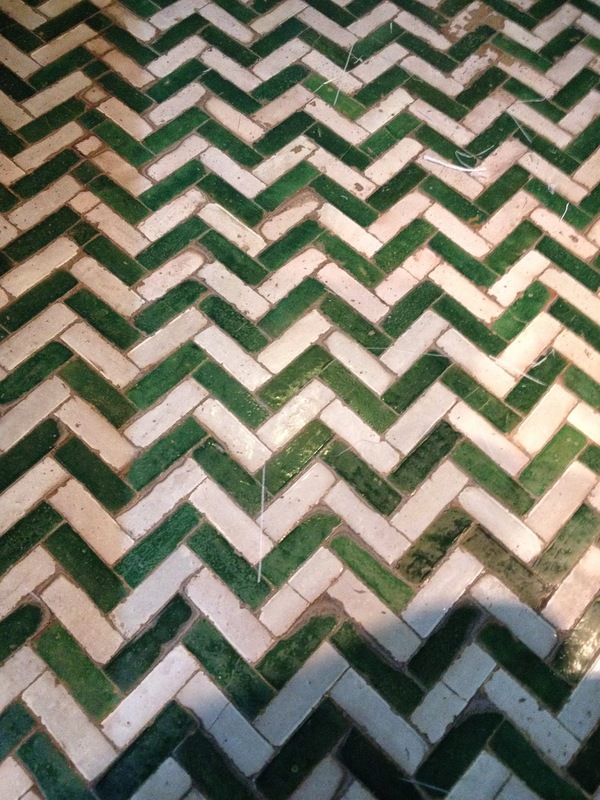 This tile is literally from Roman times. 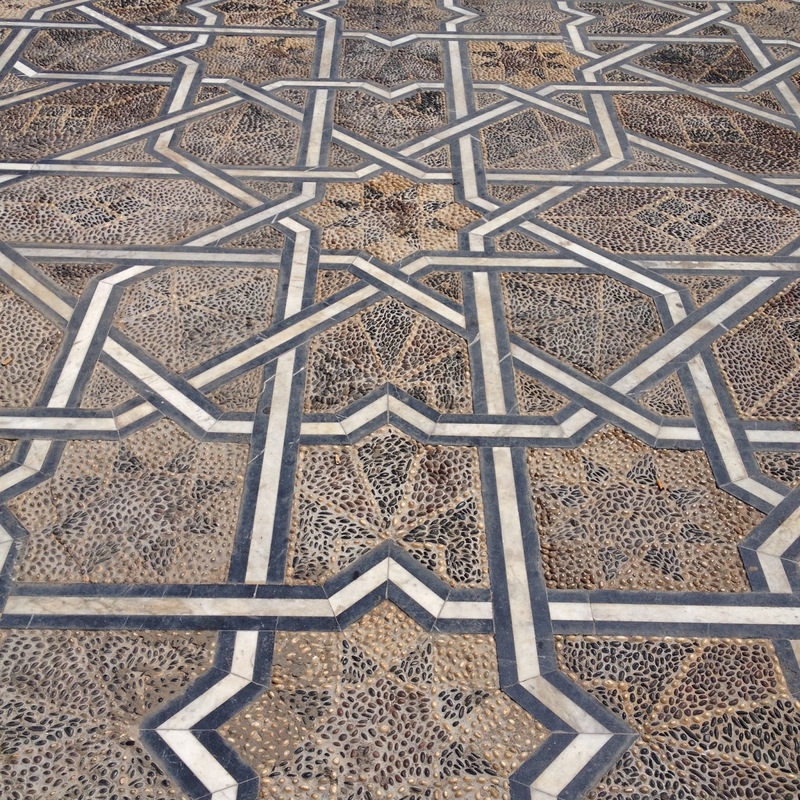 You have to love the vibrant, intricate patterns! They are often focal points in rooms. It is called zellige. In Arabic it is الزليج‎ . 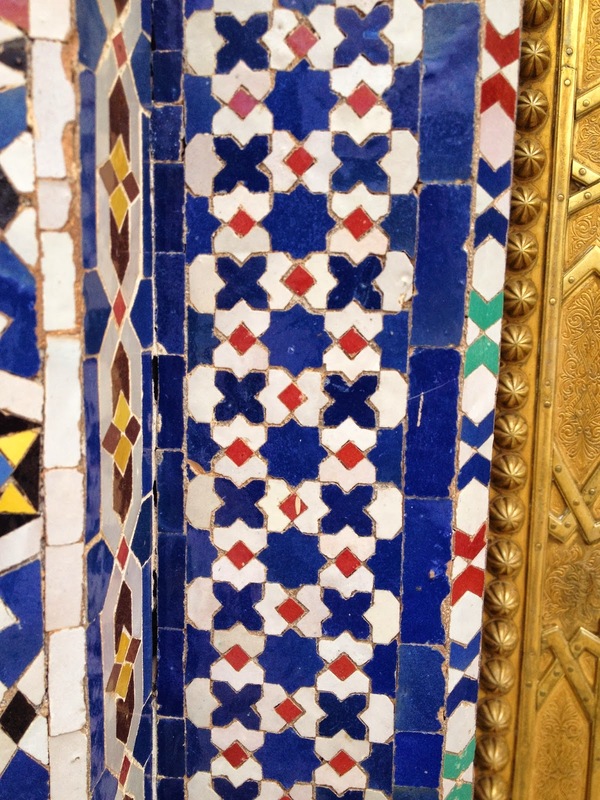 This type of tile was developed during the Hispano-Moresque period when there was huge Spanish and Arabic influence. 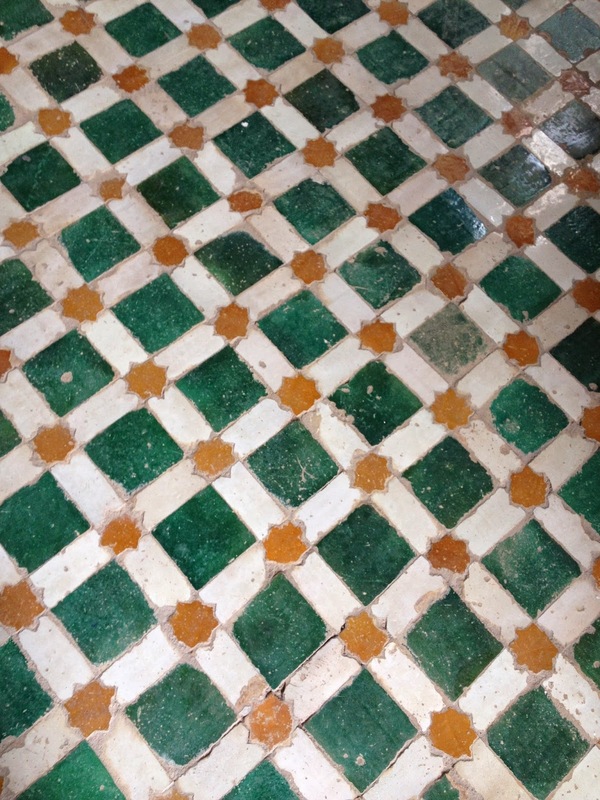 The tile itself is a terra cotta tile covered in enamel and set into plaster. 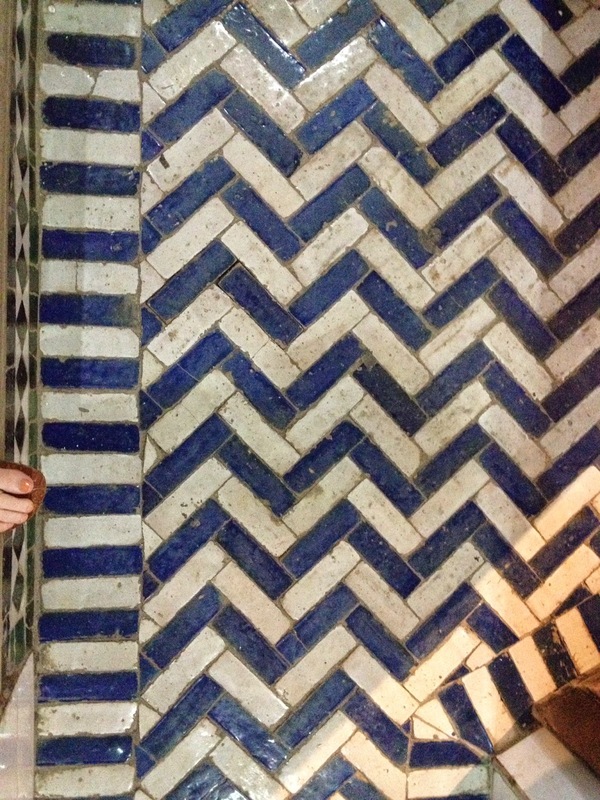 Think of the artisan chipping away at the tile above!! This has a fountain spout in the middle. See it? More fountain intricacy. 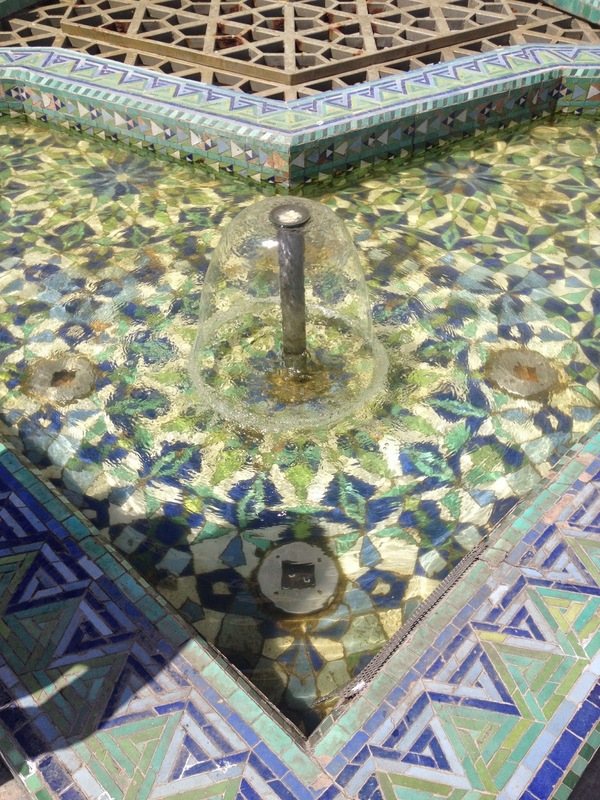 This fountain was at an enormous mosque, the Hassan II Mosque in Casablanca. 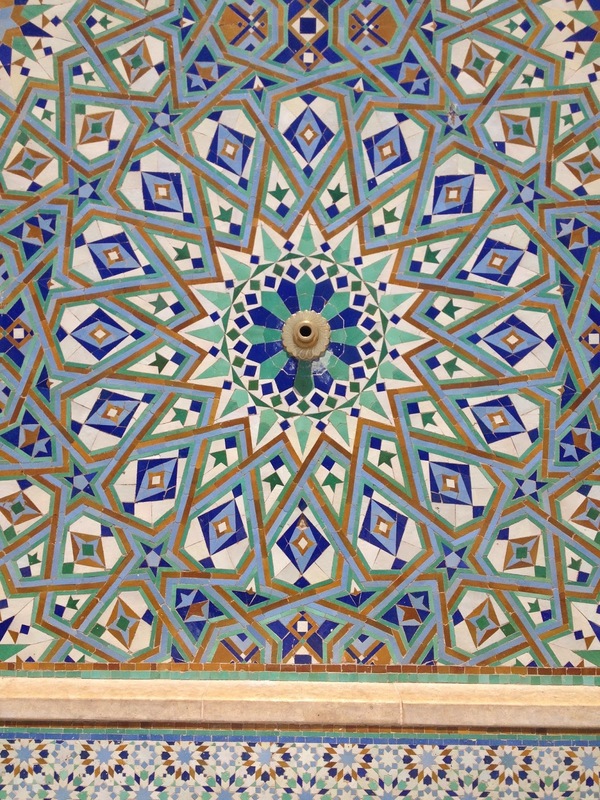 The artisans who worked on the mosque were incredible! 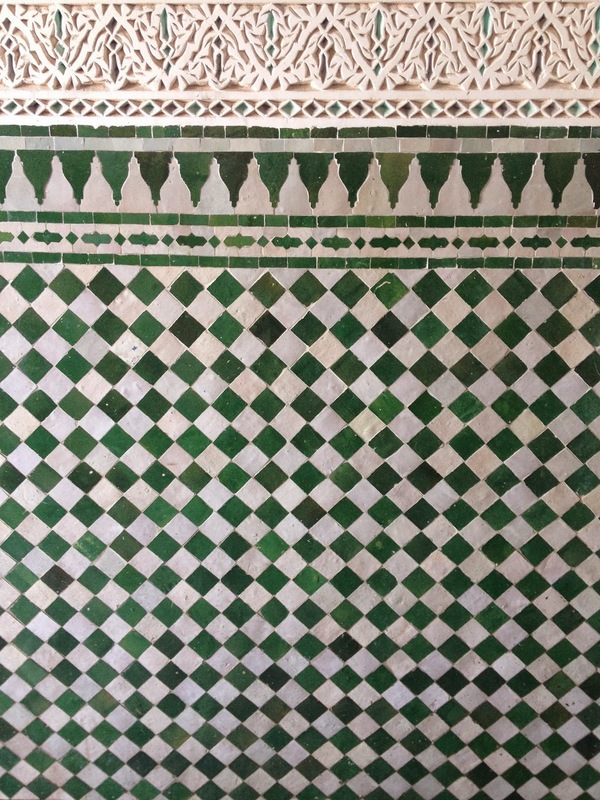 More details from the Hassan II Mosque. These colors are fun! I never would have put them together. Ooh, my model/daughter Posy! I forced her asked her to pose in front of the column. Love! 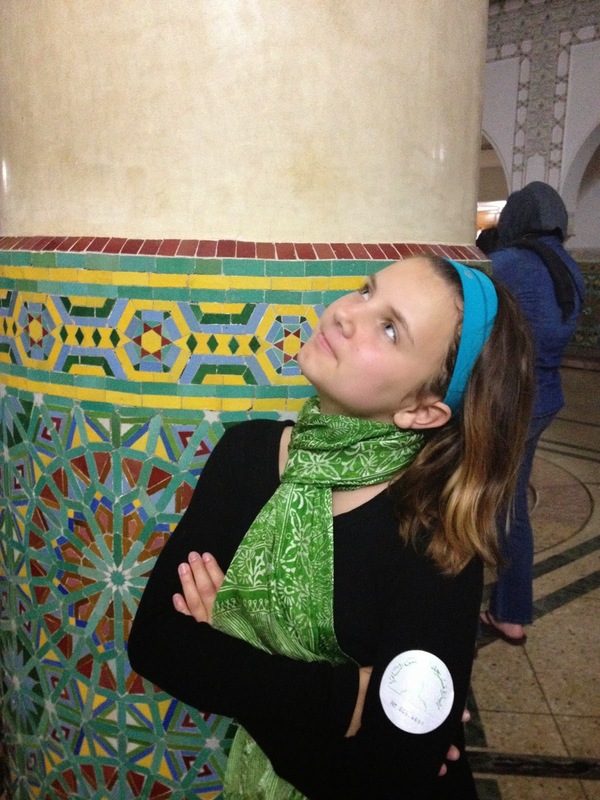 Nothing like a girl trip to Morocco!! 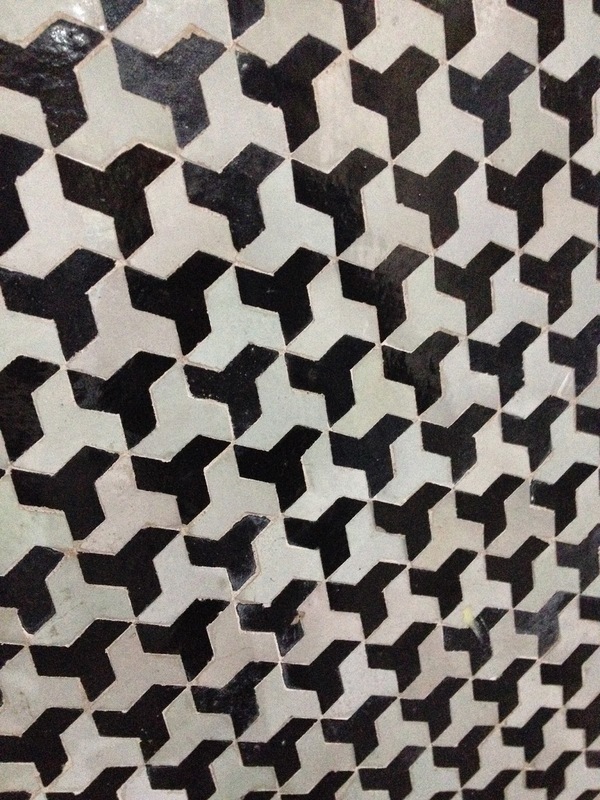 Although technically not tile, this artistry is made to look like tile. 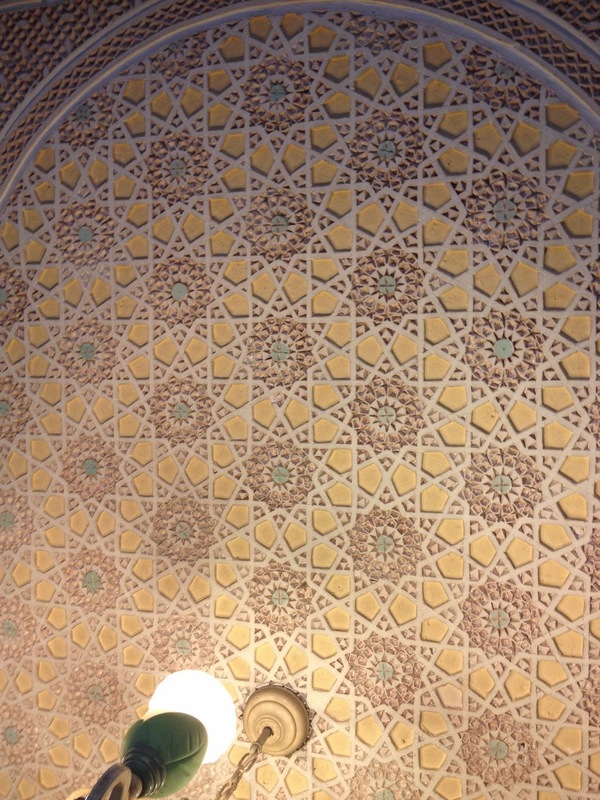 You can find it all over- on ceilings and walls. It is a plaster that when damp you can carve into. When it dries it is hard and can be painted. This was very unique. 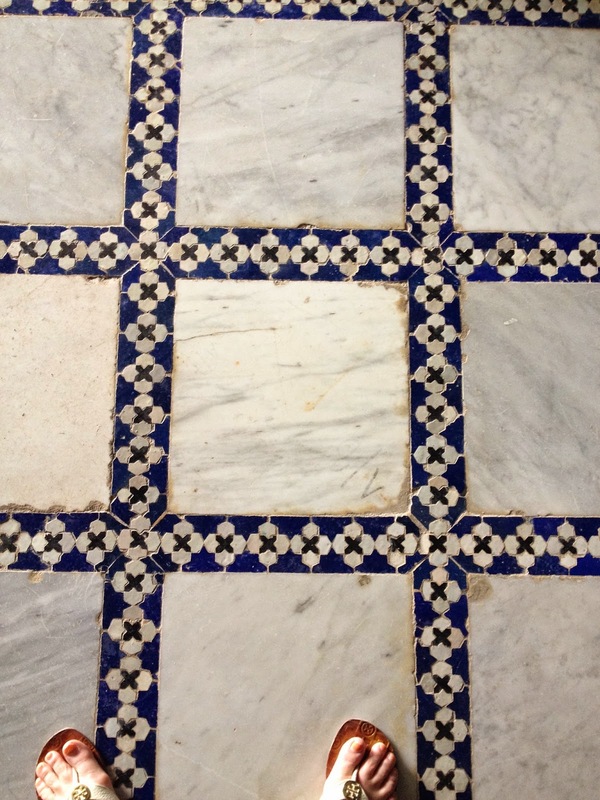 The tile work was a mixture of marble and rocks placed to look like traditional tile. 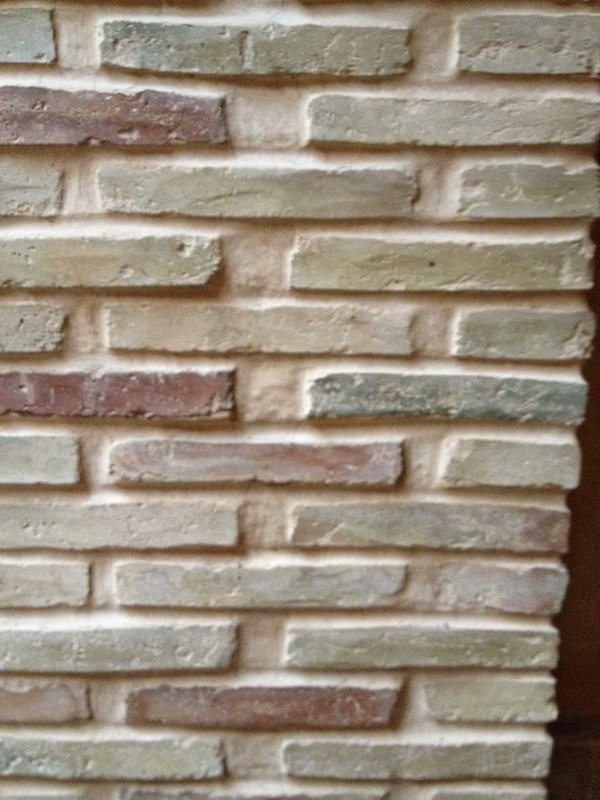 This is another mixture of the plaster and the ceramic tile. OK, this was one of my favorites! The drain!! 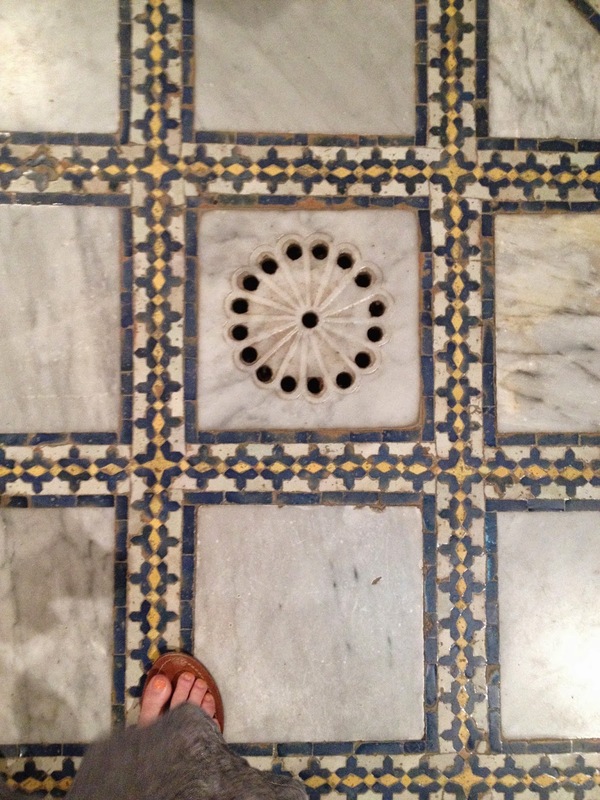 Why don't we have pretty, hand chiseled marble drains like this:-) I just love how they mixed the ceramic and the marble. A beautiful fountain close up. 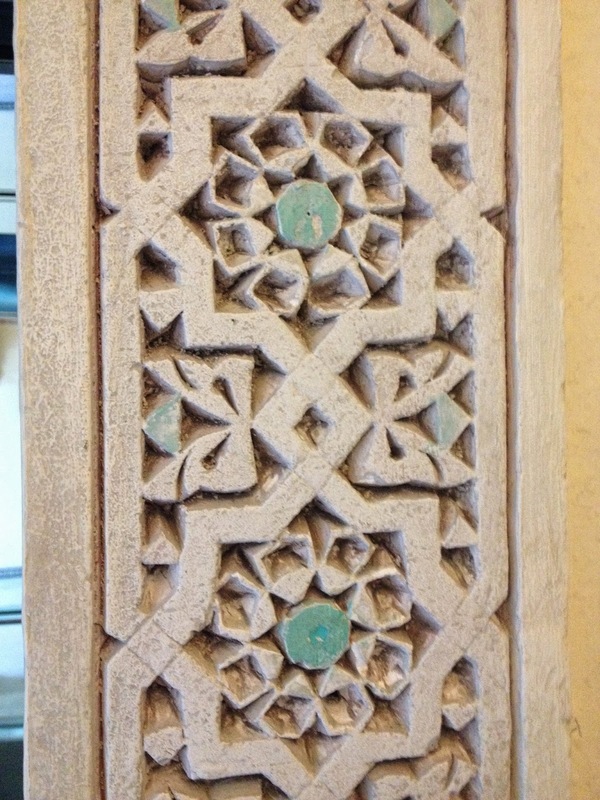 Again, a wonderful mixture of different patterns and materials. 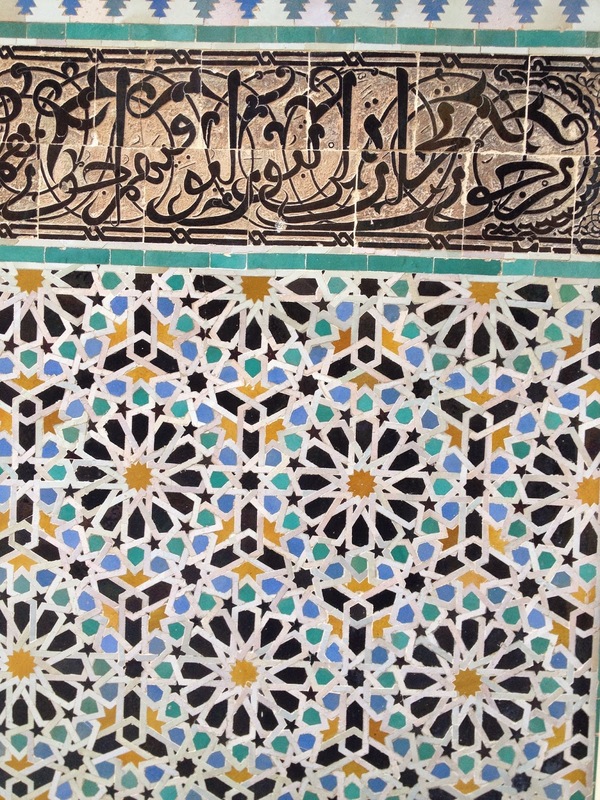 This has Arabic writing in the tile work. It is quite beautiful! 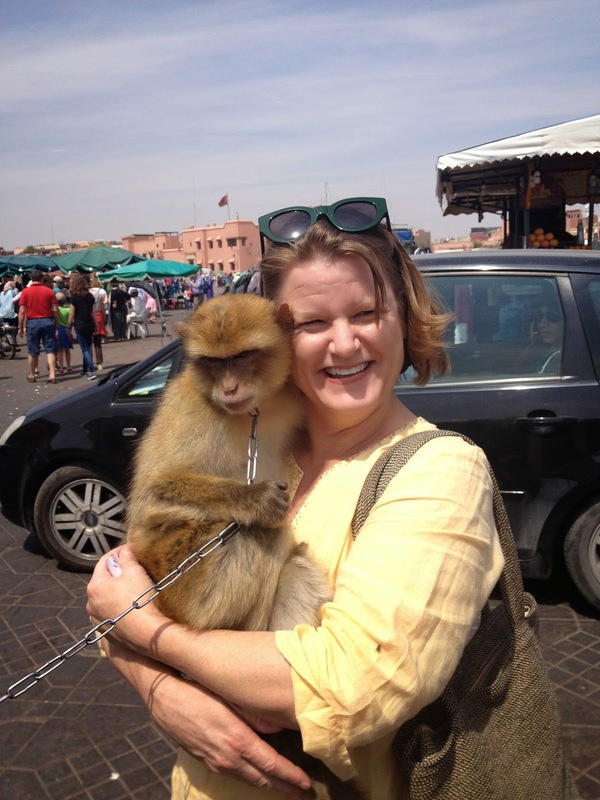 I will leave off with this photo of me and my pal in Marrakech. I can never say no to an adventure that promises to nourish me creatively! Thanks for coming on my trip!! What a dream trip! On my bucket list for sure! 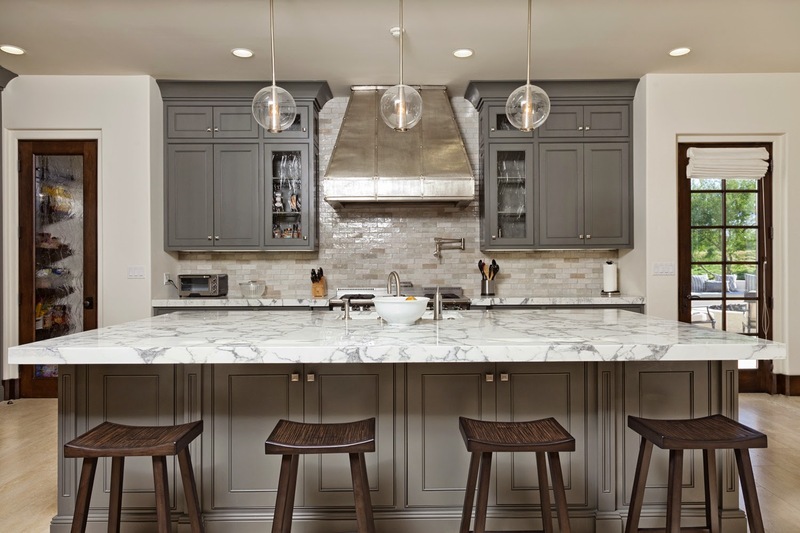 Would love some info on that backsplash tile...working on a kitchen that would be amazing in! 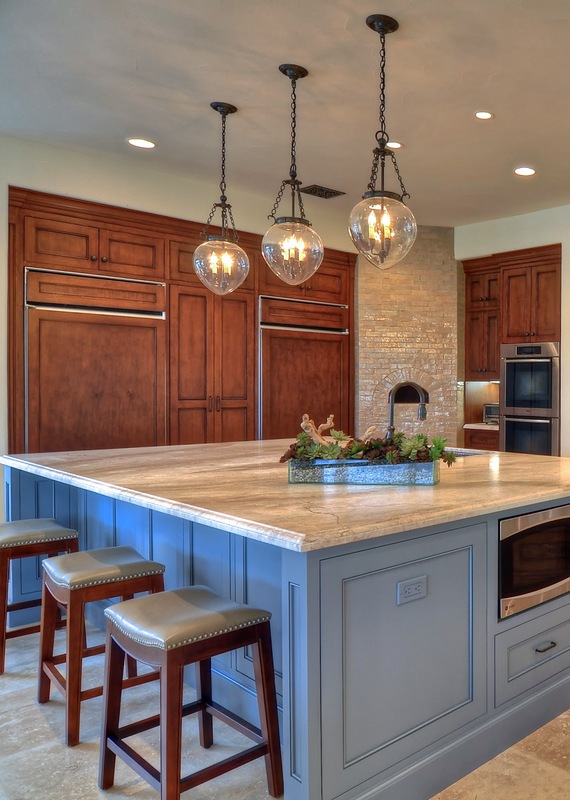 PS - beautiful kitchens! Fabulous work as usual! !